Beautiful oceanfront apartment with 2 Free Kayaks! 30 min to downtown. This fabulous waterfront apartment on Indian Arm in North Vancouver is just 30 minutes from beautiful downtown Vancouver, the cleanest most beautiful city in the world! Located on Indian Arm, a 10,000 year old fiord in a West Coast rain forest, the waterfront community of Woodlands is one of Vancouver's best kept secrets, not many people know we are here and we like it that way! Woodlands is one of Vancouver's oldest summer communities which consists of waterfront homes accessed by a 5 km country road which winds its way through the forests of Mt. Seymour, a provincial park, well known for its snowshoeing, skiing, golfing, hiking, and mountain biking, so don't forget your bike! Woodlands is much less crowded than Deep Cove and gives you that remote feeling without being remote. There is an 80 foot cement deck with gazebo and bar-b-q which for your own use. There is a 50 foot dock which holds the kayaks and rowboat as well as 2 gravity chairs, perfect for sunbathing and wildlife watching. The dock is shared with the owners to access their boat. Watch seals, seabirds, yachts, and fish boats make their way up Indian Arm to the beautiful Wigwam Inn, a private yacht club with a scandalous past! Across from the Wigwam is the majestic Granite Falls Marine Park. Bring your scuba gear as there is excellent diving right out the front door! 2 kayaks and a Walker Bay rowboat are available free of charge. Spend an afternoon exploring the many marine parks home to black bears, bald eagles, and two salmon runs a year. Power boat rentals are available at Seycove Marina in Deep Cove. The picturesque village of Deep Cove is just around the corner. It is home to some beautiful shops, including The lovely gallery at the Deep Cove Cultural Center, 4 restaurants, 3 great coffee houses as well as the world famous forest hike to Quarry Rock Lookout and Baden Powell Trail, which stretches for 50 km, all the way to Horseshoe Bay. The Seymour Art Gallery, Shaw Theatre, Northlands Golf Course, Seycove Marina Boat Rentals, Arm Reach Bistro, Honey's Donuts, Bluehouse, Room Six, Ahoy, Oursi, Coffee, Parkgate Community Centre and Library are all close by. Come and immerse yourself in a waterfront living experience without breaking the bank. Room rates are between 200.00 and 220.00 Canadian a night, only a 50.00 cleaning fee and 300.00 refundable damage deposit, one of the least expensive on any vacation rental website. Most suitable for 2 to 3 adults or 2 adults and 2 children. One queen bed and 2 double beds. Check in is 3pm and check out is 10 AM. If you are looking for a fantastic vacation spot close to all of what Vancouver has to offer or are working short term in Vancouver, this is a great place for a home base. Come stay at an unbelievably beautiful waterfront location close to the City of Vancouver. Elaine and Tony have been married for 20 years and have 2 grown children. Elaine is originally from Halifax and lived on the ocean in St Margaret's Bay, Nova Scotia. She came to Vancouver and obtained her Bachelor of Social Work Degree as well as a Chartered Herbalist diploma.Tony is a city boy born and raised in Vancouver. He has been a financial advisor for 35 years.Together they did an extensive renovation on the property after it was sold to them by the Rubbermaid heiress who moved on to build on Cortes Island. They have been doing vacation rentals in this location for 16 years. 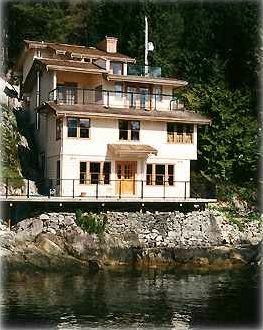 We both really wanted to be on the water and as we could not move to Nova Scotia because of Tony's work, we set out to find a waterfront home close to downtown Vancouver and found it on Indian Arm, North Vancouver. The best part about staying here is the view as well as the deck and the dock! There is also a gazebo and barbq The apartment feels like you are on top of the water. The apartment is very spacious and comes with lots of extras like the kayaks, life jackets as well as countless books, magazines and a few children's books and toys such as lego. We are happy to show you how to use the boats and to show you the trails on Mt Seymour. West Coast photographer, Andy Chamberlayne's, work is featured throughout the apartment. I honestly do not think you will find a nicer place in Vancouver and it is affordable for families. Oceanfront with private 80 foot deck and dock with 2 kayaks, rowboat, and 2 swim ladders. The apartment has a steam room, BBQ, 2 kayaks, a rowboat and crab trap for guests to use. We are close to hundreds of hiking and mountain bike trails on Mt Seymour. There is scuba diving right out the front door. Snowshoe and ski Mt Seymour, Grouse or Cypress, all within half an hour of the house. Close to HWY 1 just 35 minutes to the heart of downtown Vancouver and 1.5 hours from Whistler. Get the wilderness feel with the convenience of the city. 4 night minimum in July and August. We have had a great time at Elaine and Tony’s place. Thanks Elaine and Tony. We will be coming back. This place is great. For the price of a small hotel room, you are waterfront in a very spacious 2 story unit. You have access to free kyaks, hiking nearby, and of course, the incredibly tasty Honey's doughnuts to start the day. We will definitely stay here again on our next visit to Vancouver. We arrived at Elaine & Tony’s place on a Tuesday afternoon following a long travel day from Western Pennsylvania. The road “adventure” from Mt. Seymour Road along Indian River Drive added to the charm of their fantastic spot on The Arm. Enjoyed watching the harbor seals from our deck and from the kitchen table. We stayed unbelievably busy during our 8 day stay, day-tripping all around the areas surrounding Deep Cove, including Mt. Seymour, The Sunshine Coast, Whistler, North Vancouver and Vancouver City. We both agreed we chose a great spot to call home during our visit. Tony & Elaine made us feel more than welcome, true to the Western Canadian’s friendly / welcoming spirit. We enjoyed a five night visit at this great location on the waterfront. The scenery is fantastic and the place is close to lots of recreational activities. Will be looking to come back next year. We spent several wonderful nights at Tony and Elaine's in late July and really had a great time. The space was perfect for our family of 4 and the proximity to the quiet and gorgeous Indian Arm for recreation and relaxation was exactly what we needed at the end of our slightly whirlwind vacation in B.C.! Woodlands is a quiet waterfront neighbourhood 30 minutes away from all the hustle and bustle of Vancouver. There are 3 local ski mountains nearby. Cypress, Grouse and Mt Seymour which is your backdoor with 100's of different trails for hikers and mountain bikers. Scuba dive site right out the front door! Fee use of kayaks, rowboat. Hike the Baden Powell trail to Quarry Rock and Deep Cove then reward yourself with a Honey's donut at Honey's or artisan coffee at Cafe Orzo or lunch at Arms Reach Bistro. Browse the local art gallery and gift shops as well as the other well curated shops in Deep Cove.